Developer Les Otten had the North Country hopeful he would revive the 150-year-old resort, shuttered since 2011. (DAVID L. RYAN). DIXVILLE NOTCH, N.H. — Because room service didn’t exist at the Balsams Grand Resort, every meal was eaten in the dining room, in one’s best clothes, at a table with strangers. Your waiter came to know your preferences because you had the same wait staff your entire stay. After dinner, guests socialized or borrowed a book from the library because rooms had no TVs or Internet. It was intentional, and it worked. The resort’s return rate was 85 percent even though it sat in remote northern New Hampshire, less than an hour from Canada and at least 3½ from Boston. Until his financing hit a major snag in August, developer Les Otten had the North Country hopeful he would revive the resort, shuttered since 2011. Three months later, enthusiasm is giving way to doubt, even as Otten remains publicly certain he will find another way to raise $170 million needed for the project. Balsams? And is that even his goal? He says yes — and no. Large parts of the Balsams, a New England institution since 1895, are starting to crumble. Otten has been trying since 2014 to arrange the financing for a rebirth. The August setback came when skeptical state officials declined to guarantee a $28 million loan that Otten once described as critical. Now he is seeking new legislation that would allow him to get the loan without a state guarantee. For Otten, saving the past means keeping the Balsams’ trademark castle-like buildings, its famous gourmet meals, cooking school, and golf course designed by legendary Donald Ross. But Otten said modern updates will be necessary if the Balsams is going to create a new generation of loyal fans. Those updates would include improved skiing trails, dress-down dining options, air conditioning, an outdoor spa, yoga, and both Internet and cell service. Otten, a former minority owner of the Red Sox, compared the Balsams to Fenway Park. Almost 20 years ago, Otten and his partners fought to save and improve Fenway rather than raze it and build new. 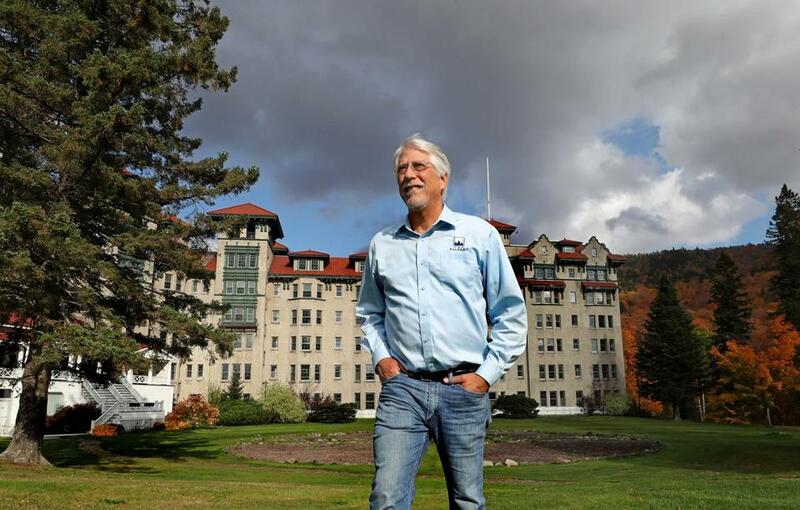 Rooting him on is Steve Barba, the person whose goal as manager for 36 years was to fend off any efforts to modernize the Balsams experience. “It was anachronistic when we were doing it,” said Barba, who with his business partner retired in 2005. “We knew it was unlikely that it was going to carry on beyond us. Edith Tucker, a state representative from Randolph, is cautiously hopeful the Balsams will reopen for the same reason Barba cited: the 600 construction and 400 resort jobs Otten has predicted. But today’s economic realities of increased operating costs and more accessible accommodations make it harder to do what the Balsams did. For visitors, those throwback touches could start a lifelong love affair with the Balsams after even a single stay. Concord, N.H., lawyer Jay Surdukowski spent one night at the Balsams before it closed, for the 2000 presidential primary. He was 20, a political junkie, and working for John McCain. Just before voting began at midnight, McCain called Barba once more for his vote. So special, that 12 years later, shortly after the Balsams had closed, Surdukowski — and 1,300 others — returned for an auction of nearly all its contents. Surdukowski spent 13 hours there to win 10 dining room chairs, three Balsams-imprinted platters, and two ski lift chairs, despite having never skied there. Will vacationers be willing to make the hours-long drive to reach isolation? Otten believes so. He has calculated that 12.5 million people live within a 4½-hour drive to the Balsams. It’s the isolation, he said, that makes it worth the drive. During a recent tour of the property, which sits on 11,000 undeveloped acres, Otten talked about the value of what guests wouldn’t see from the property: other buildings, traffic, a street lined with souvenir shops. What they would find are 60 miles of backcountry trails, three lakes, a golf course with panoramic views, and what Otten describes as the biggest ski resort in the East. “It’s going to be a playground for people with an active sense of life,” said Otten, who ran American Skiiing Company when it was one of the nation’s largest operators of ski resorts. James Monahan, managing partner at the Dupont Group, a government affairs and public relations firm in Concord, N.H., organized several conferences at the Balsams for the New Hampshire Association of Counties. The isolation was a plus. Barba made it a priority to foster that kind of atmosphere. The Balsams was also legendary for its relationship with locals and for more than only jobs. Hicks attended his high school prom at the Balsams. Locals skied and golfed at the resort. Neil Tillotson, who bought the resort at an auction in 1956 and whose corporation owned it until 2011, provided scholarships to local high school students and sourced food for the kitchen from local farms. But the jobs, and the relationships Tilotsen created with workers and their families, were the most important. Otten intends to resume the Balsams’ partnership with the local community, and like Tilotsen, do so with more than only jobs. He wants to run farm-to-table kitchens and plans to bring back an open-air market for local artists. Time may be taking its toll, however.